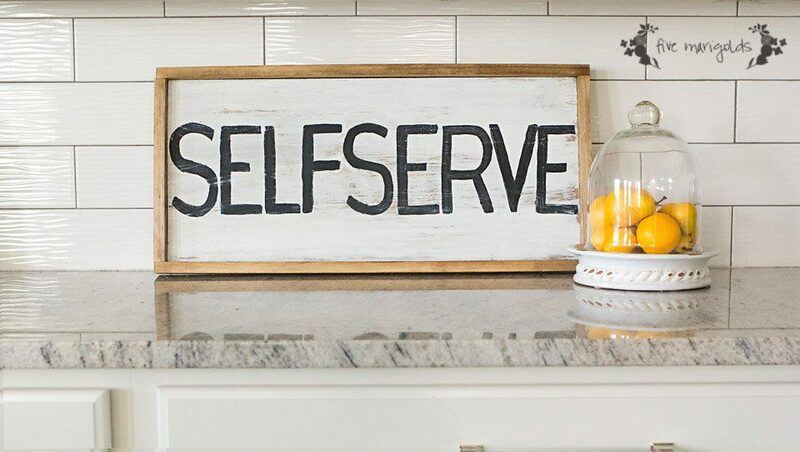 Reversible Upcycled Kitchen Sign: Self Serve Only! 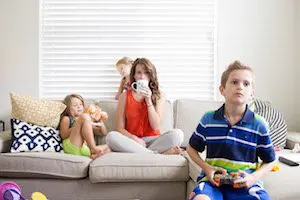 It’ s been awhile since I’ve shared on the blog. I ran out of steam there for awhile, but I’m back with a project I’ve been planning for some time, and finally got around to: my self serve sign for the kitchen. We’re slowly but surely making some changes to our builder grade home, like a new back splash that we love. Still, I thought the kitchen needed a little more character. I used a scrap of wood and had my husband make a DIY frame, just like we made for our engineer print gallery. I stained the base and frame with engineer print gallery. 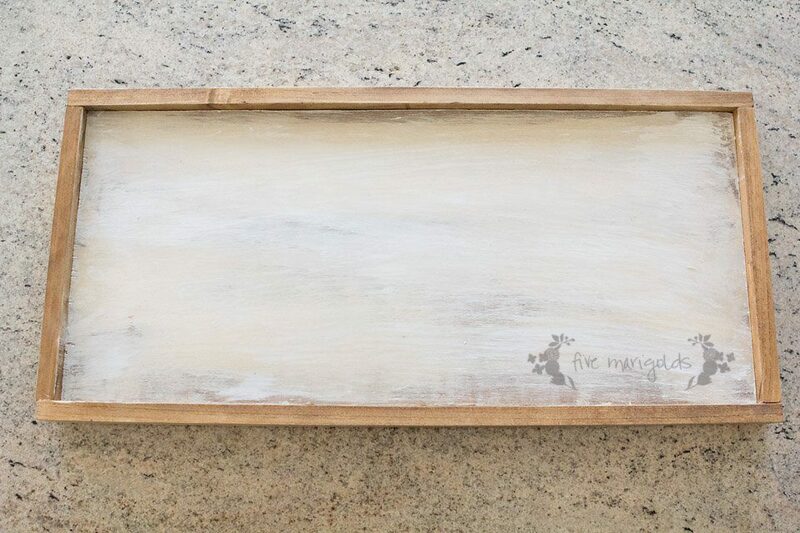 in Early American, just like our Proverbs 31 canvas frame. Then, I dry brushed the sign with some flat white base paint and sanded to give it a old, weathered look. I decided to print the words on paper and used a Sharpie to make a rough stencil. I then used some leftover chalkboard paint to fill in the letters. I sanded it one more time to keep that weathered feel. I love my self serve sign! I couldn’t decide what phrase I wanted to use for this project, so I decided to make the sign reversible. For the back side, I used the same stain and sanded paint for my base, but I wanted a more polished look for my letters. I cut these vinyl letters on my silhouette and stuck them on. What do you think of my budget kitchen art? 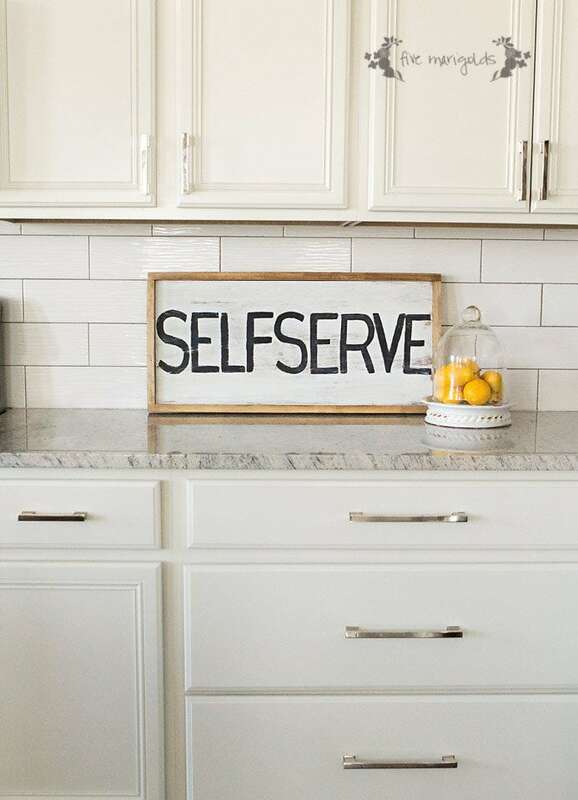 What phrase would you put on your kitchen sign? 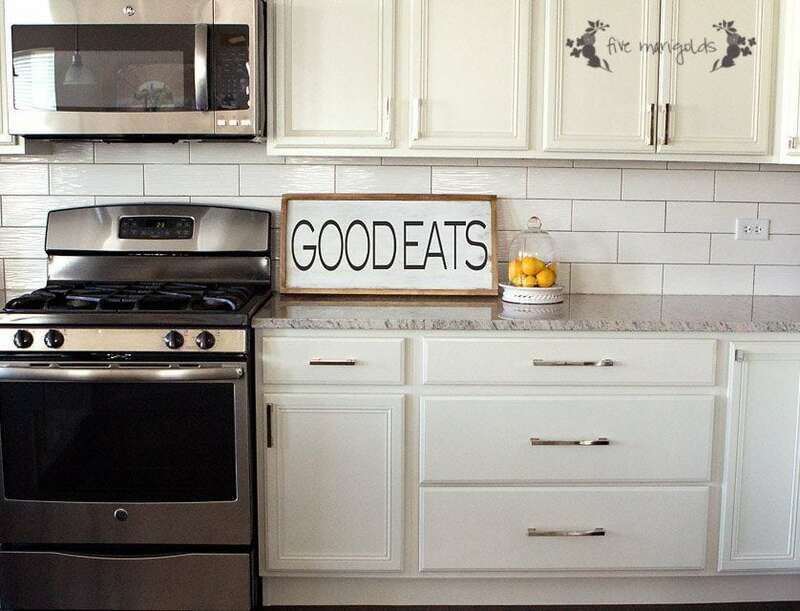 Nice sign, looks great against your new backsplash! Sign looks great and it gives me an idea: My parents are retired from running a gas station. May see if I can dig up an old Self Serve sign from the pumps and make something similar for their kitchen! Thanks! That would be awesome! I would have loved a real vintage find like that! Love your budget kitchen! Who says it has to be expensive to have a cute kitchen?! OMG I love this sign… need one for my kitchen for sure! I absolutely love this! They are cute and rustic! Im planning on making some signage for our house soon! Oh what a great idea! Then you can switch them up! Very cute. That looks gorgeous. Great job and a wonderful addition to your kitchen. Love the style. I love that the sign is reversible! It looks really great in your kitchen, too. Loves this…looks easy to do as well, will definitely try to recreate it. Great job! Oh my goodness…I luv that sign! We would love to have you come party with us at our Show and Share Party. Hello, I’m dropping by from the DIY Show Off Party. Your self serve sign is so pretty and creative! Thanks for sharing it. I love your DIY finished project and even more so, your beautiful kitchen. I think it’s a smart move to have two options for display. This is such a cute little craft idea! It turned out so well. i love these types of projects! now where can i put a sign…? I just love signs so much and this turned out great! Such a great idea to make it reversible! Thank you for sharing this at Welcome Home Wednesdays! What a great project! 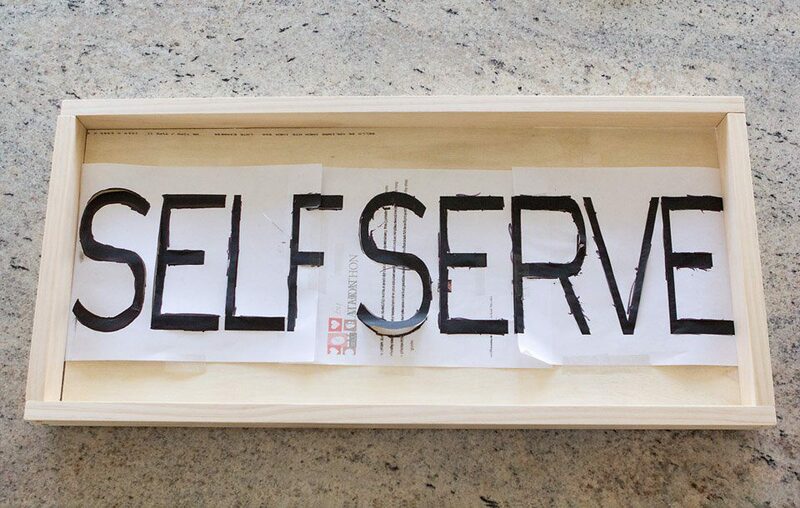 I love both sides, but I am really inspired by the “self serve”! I think I will make something like that and put it over our coffee maker for when we have houseguests! I think if I make one, I will write the words in French “servez-vous” cos I love that phrase! Thank you for inspiring me! Your kitchen looks great! I love the sign and that it’s on a budget. Great idea!